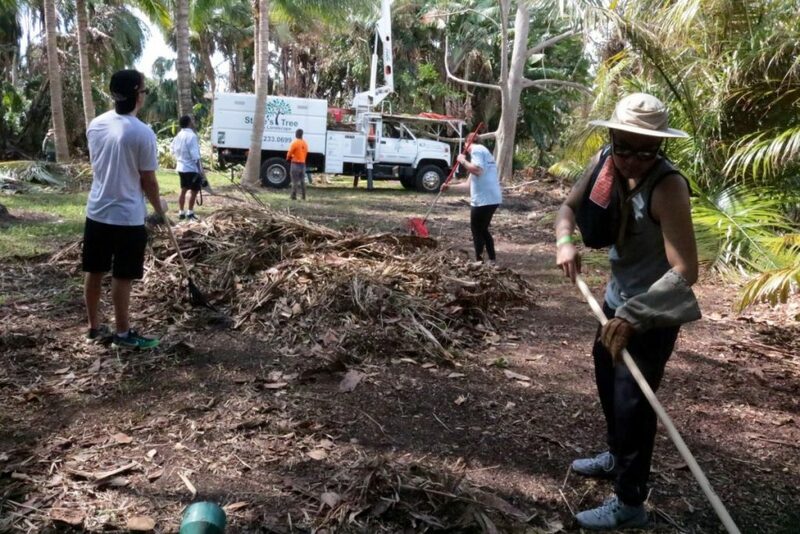 Nearly two weeks after Hurricane Irma barreled through South Florida, a high turnout of University of Miami students assisted in recovery efforts across Miami-Dade County as part of the Butler Center’s Hurricane Irma Relief Day of Service. The event, held on Friday, Sept. 22, three days before the resumption of school after a 20-day break for students, sent over 200 student volunteers to nine different locations across Miami such as Curtis Park, the Chapman Partnership, Pinecrest Gardens and UM’s own arboretum. Given that many students are still returning to Miami, Butler Center Director Andrew Wiemer was happy to see the high turnout. “Words can’t even describe how wonderful it is to see students come out, right before classes start, and go out into our community and give back to these agencies with such need,” Wiemer said. For several students, including sophomore Dayana Hano, the service day was the first Butler Center event they’d attended. Hano, a commuter student, said she readily volunteered because the effort would have an immediate impact on South Florida. University administration first began planning the service day in collaboration with the Butler Center last Thursday, Sept. 14, at the request of President Julio Frenk. According to Butler Center Assistant Director Brittany Brewster, Frenk wanted to ensure the university was a leader in giving back and responding to the hurricane. Frenk made the message clear during his opening remarks on the day of service. At each work site, groups of approximately 20 volunteers were assigned with tasks such as clearing tree debris, sorting food and clothing donations, and cleaning garbage off the shoreline. Volunteers at each site worked for four hours, saving days’ worth of work for regular employees. There are three full-time employees who maintain the entire park of Pinecrest Gardens. However, the storm created a much heavier workload for them. Most of the park’s pathways were inaccessible and required a full day’s work to clear. Glenn Hilton, one of two Pinecrest gardeners who worked with UM students during the service day, said that the grounds would take months to regrow and become fully presentable. The historic park suffered substantial damage from a tornado that touched down just outside the parking lot. Dozens of trees were torn down by the forceful winds, including an iconic, decades-old banyan that once spanned nearly an acre. With Hilton’s help, 16 volunteers and site leader Kimberly McGrath-Moreira cleared over 30 carts of vegetation and debris from Pinecrest’s upper garden, which will re-open to the public Monday, Sept. 25. McGrath-Moreira, an English professor, also worked with the Butler Center for the first time Friday. She said, as part of a civic engagement unit, she requires students to serve in the community. She said she feels that volunteering is especially important in the wake of natural disasters such as Irma. As the university returns to normal operations Monday, Wiemer is hopeful that the student body will continue to engage in service efforts, and watch for more opportunities to donate and volunteer in the weekly Butler Connection email.